I had an opportunity to leave town for a week, so I decided to hop on over to NYC to visit old friends and catch up with the city. I didn’t do a major gastropocalypse tour this time around, hitting all the necessary landmarks like EMP, Momofuku, Per Se, etc. As far as food goes, this is what you need to know: Brooklyn is happening, and take your appetite to Martha, Glady’s, and Chuko. I also found an amazing old bar that is stuck in the 1970s and is a killer place to have a drink and be left alone, and in that spirit I’ll keep that one to myself. But this post isn’t about food, it’s about Ferran. 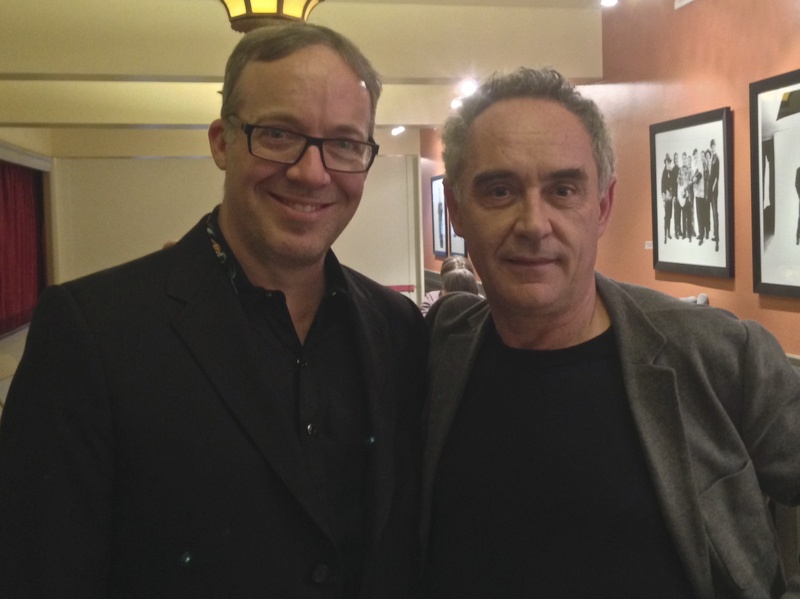 Ferran Adria, chef of elBulli, one of the great artists of our time. 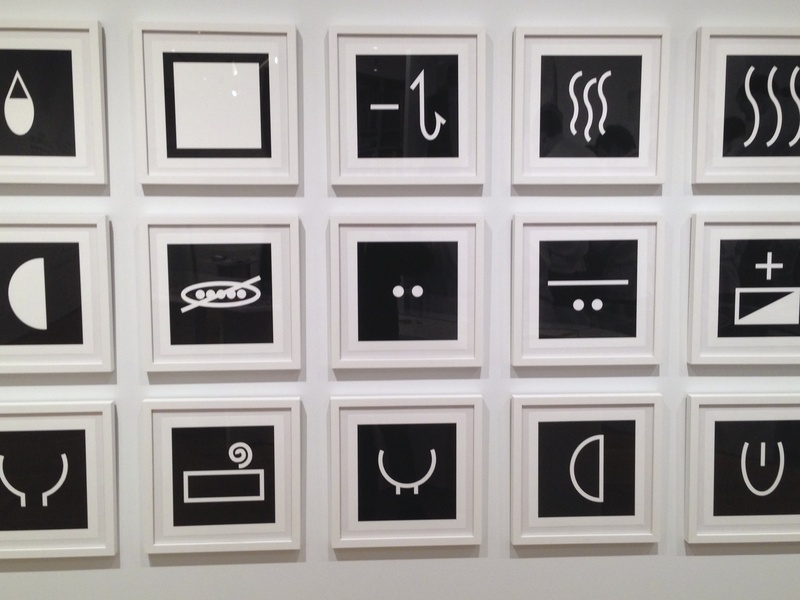 The Drawing Center in Manhattan had the first major museum exhibition to focus on his drawings and concepts. I, of course, went to see it. Little did I know I’d soon see him myself. 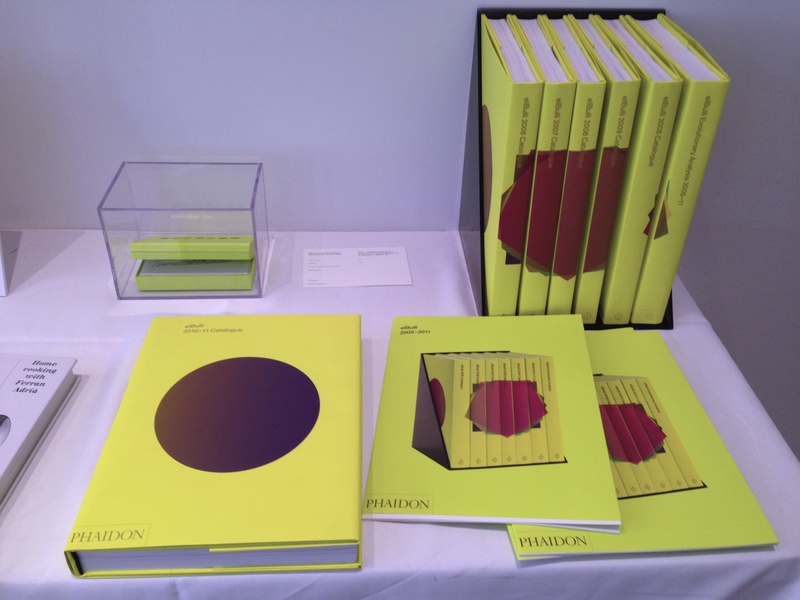 A copy of elBulli 2005-2011 sitting there open to be perused. Although it is available now, it wasn’t two weeks ago, so I was psyched. As I started to leaf through it, my passion for avant-garde cooking welled up inside me. It was discovering his food several years ago surfing the Internet that turned me on to the whole thing in the first place. The beauty of the food, the complete documentation and perfectly executed presentation of the entire concept just blew my mind. It’s a landmark. I walked into the main gallery and there were his notebooks, with all his ideas as he thought them up, sitting under glass. Scribbles and doodles, notes and notes on the notes, the origins of new permutations of cuisines were laid out before me. The creative process laid bare. Large images of his classification pictographs were framed upon the wall. 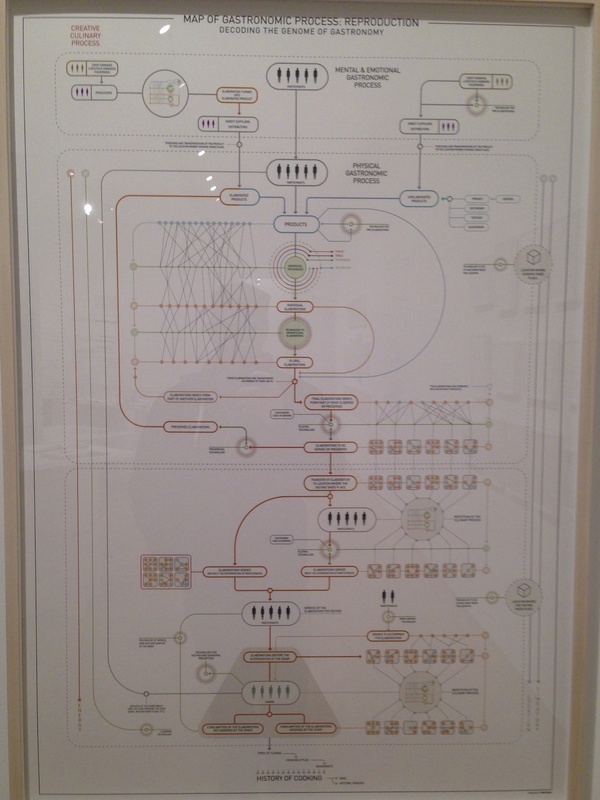 The Map Of Gastronomic Process. This is an attempt to fundamentally understand the entire process of food – from origin to production to preparation to presentation to digestion. It’s insane. It took 10 people several years to build this map out. And it cost 1.5 million euros. 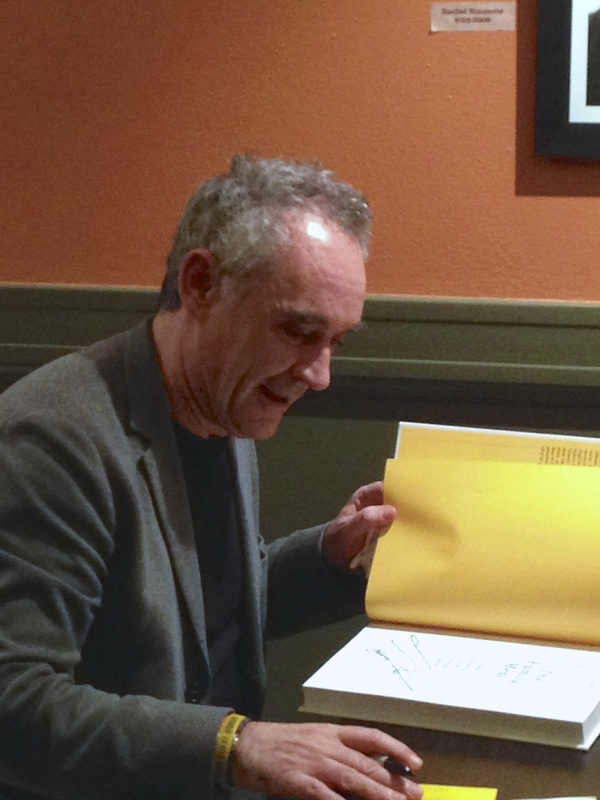 This is what I love about Ferran Adria – the man goes for it with total commitment. 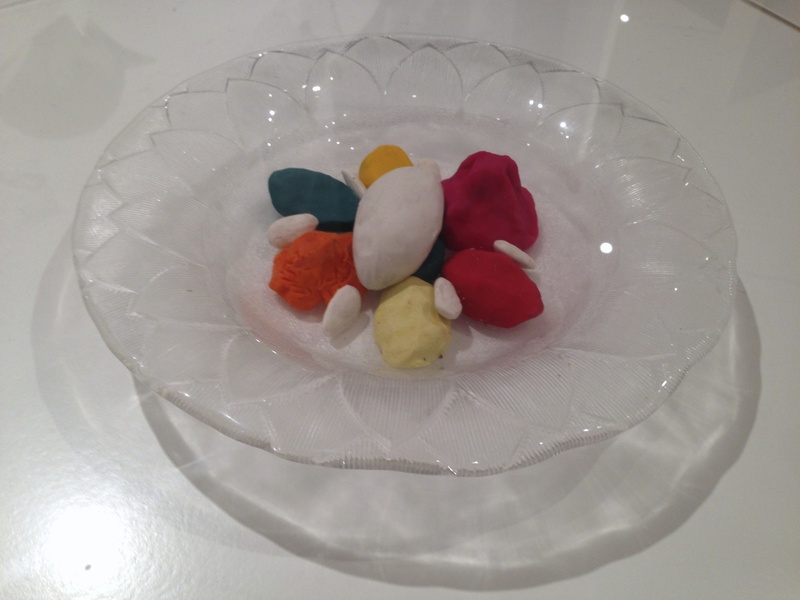 Another cool thing was finding out at elBulli they used plasticine – basically play-doh – to model their dishes. All shapes and sizes and colors to determine how they wanted a dish to appear. Once again, just so incredibly thorough. Downstairs in The Drawing Center they had a movie that showed every dish elBulli produced in chronological order while the symphony based on a dinner at elBulli – Bruno Mantovani’s Le Livre des Illusions (Hommage à Ferran Adrià) – played as the soundtrack. It was an inspiring exhibit and brought a renewed appreciation of his work. I’ve read his cookbooks, eaten his food, tried one of his restaurants, made one of his dishes, even hunted down and made the first dish he professionally cooked. I mean, what else is there? Well, I guess I could meet him. I returned from the East Coast back to the West Coast, and a couple of weeks later it popped up that Chef Adria would be speaking here as part of his tour to promote elBulli 2005-2011, as well as let people understand what is happening with elBulli. 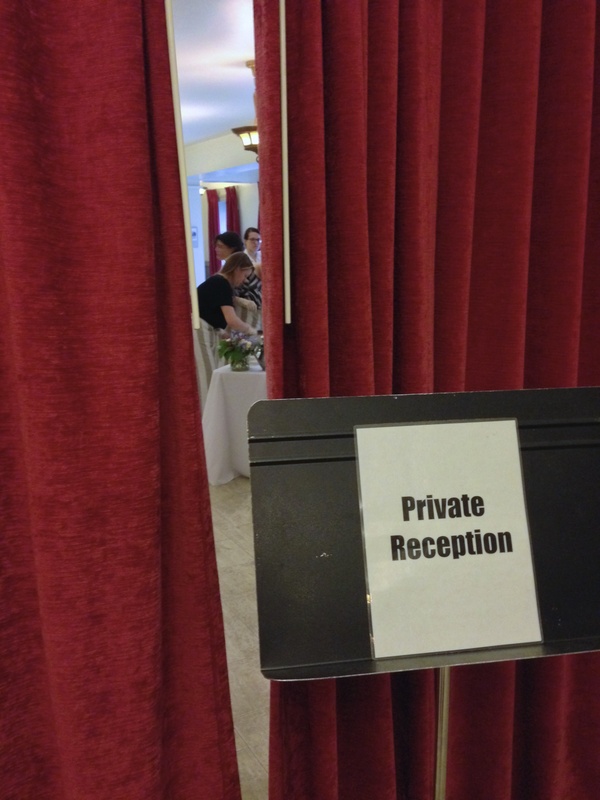 I immediately bought my ticket, and paid a little extra for a private reception beforehand. If you bought elBulli 2005-2011 there, they gave a you a series of plates of photos from the book – basically postcards – signed by him. I went it in with the other attendees and had a selection of small courses provided by local restaurant The Walrus and The Carpenter. And there was Ferran, eating and chatting. Soon he was overwhelmed with people gathering to speak with him, so he sat down and started to sign books, and for those who didn’t have books, napkins. I was last in line (I hate waiting in lines, so I just ate and talked with others until it was done), and went up with my napkin in my hand. I showed him the pumpkin oil sweet I made and told him I made it at home. He seemed genuinely surprised. I’m sure they had their troubles nailing it too. He signed the napkin with “Good food feeds the soul”. Indeed it does. 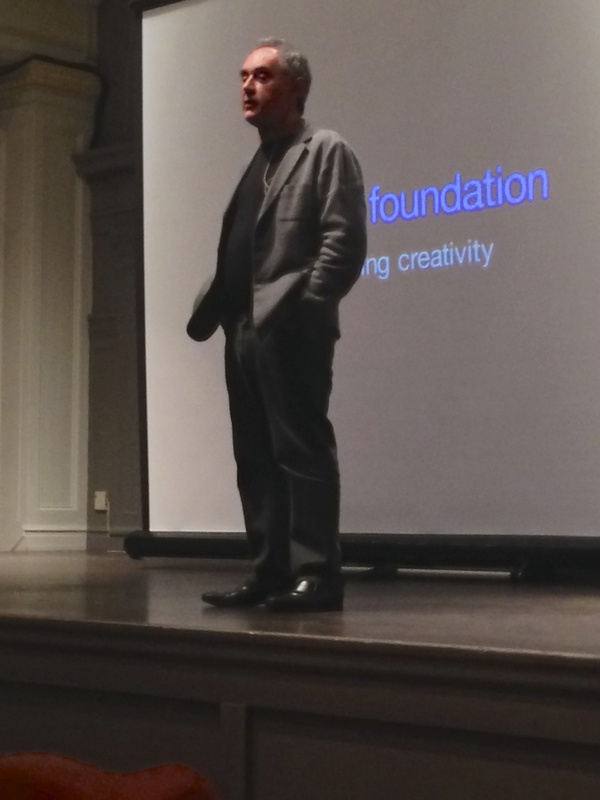 After 90 minutes we filtered into the lecture hall and he was introduced by none other than the Director of Applied Research of Modernist Cuisine. 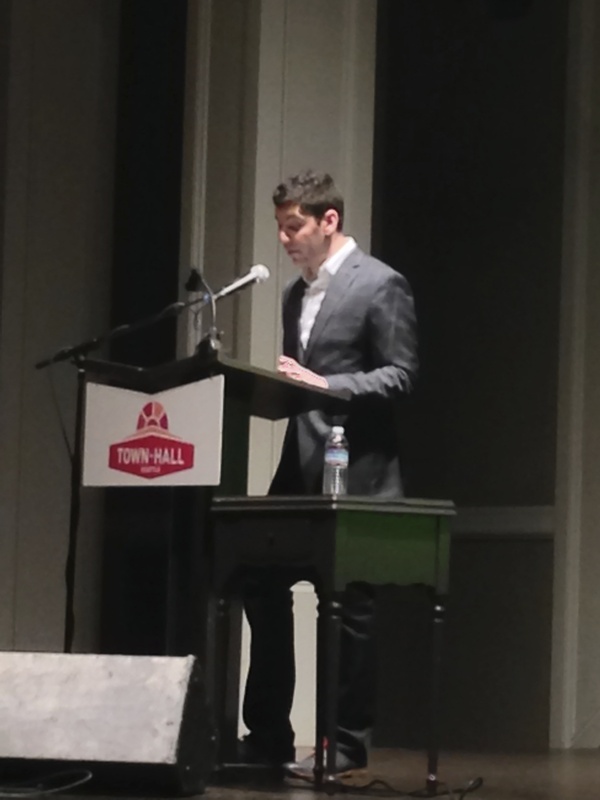 I am speaking, of course, of Scott. My favorite quote from his intro: “[Hearing him discuss an idea] is like watching Neo stop bullets in midair”. Ferran came up and began to discuss elBulli. Because, well, elBulli hasn’t closed – it has transformed. It is now three separate things. If I have this right, the first, elBulli 1834 (named after the number of dishes created at elBulli and also Escoffier’s birth year) – will be a place where visitors can come and learn about creativity and cuisine. It will also be a place for gastronomic research, inviting people from any and all disciplines to work on collaborative projects. The second is elBulli DNA, which is the creative team of elBulli, who will continue to create new techniques and approaches to cuisine. Finally, elBullipedia, an online resource for learning about gastronomy in a very deep, structured fashion. He then started to break down the history of cuisine, starting around 45,000 years ago. He challenged our preconceived notions: is champagne a drink? No, because it can be an ingredient. If a diner puts together their dish or seasons it, are they any different from the cook? If you take away cutting and boiling, 30% of cooking disappears. Yes, he was that detailed. He went on, completely engaged and engaging. So much so he ran out of time to ask questions. No matter, he said. “I have asked all the questions and answered them”. That got a big laugh, and with that, a standing ovation. It was exactly what you’d expect from him – continued evolution, persistent questioning, insatiable curiosity. It was a honor to meet him and there is no doubt that even with his restaurant days over, he will continue to influence, shape and inspire all areas of gastronomy for a long time coming. And I suppose that’s what is to be expected – it’s what all great artists do. 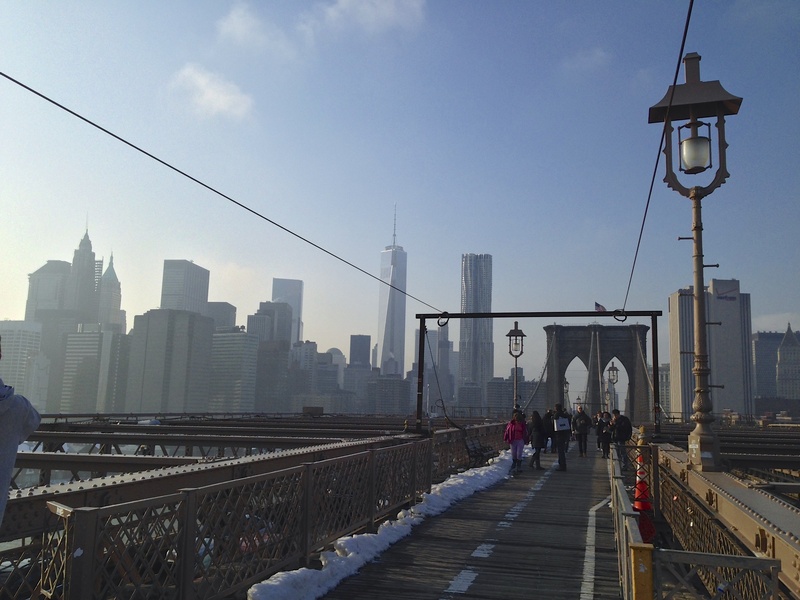 Glad to hear you enjoyed NYC. Gotta love Chuko and Martha, my neighborhood spots. The world keeps freakishly getting smaller…I ran into Scott Heimendinger at a dinner in NYC the other night.